I’m pretty shocked at the poor indexing service given by Thompson Reuters Web of Knowledge (or ISI Web of Science as you might know it). I performed a very simple search today looking for the articles containing the word ‘cladistic’ but NOT ‘phylogen*’ for articles published in the year 2010. Na, B.-K., Bae, Y.-A., Zo, Y.-G., Choe, Y., Kim, S.-H., Desai, P. V., Avery, M. A., Craik, C. S., Kim, T.-S., Rosenthal, P. J., and Kong, Y. 2010. Biochemical properties of a novel cysteine protease of plasmodium vivax, vivapain-4. PLOS NEGLECTED TROPICAL DISEASES 4. 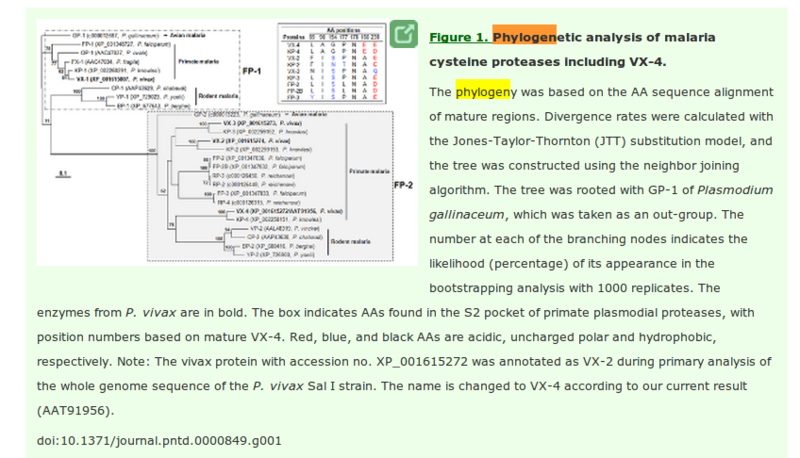 In which we find the text caption for figure 1 mentions ‘phylogen*’ twice! so at the very least I suspect Web of Science (WoS) is systematically NOT indexing the caption text of figures (if you know more than I about this, please do comment). Academics rely on services like this to effectively and accurately search the literature, to perform comprehensive reviews and such. If all the textual content of science isn’t actually being indexed by WoS, that’s clearly going to lead to bad science at some point (e.g. a vital missing paper, not picked up in an otherwise well designed literature search). I could forgive them for not being able to OCR the text within the images of figures, but NOT for the fully machine-readable text captions like this one. 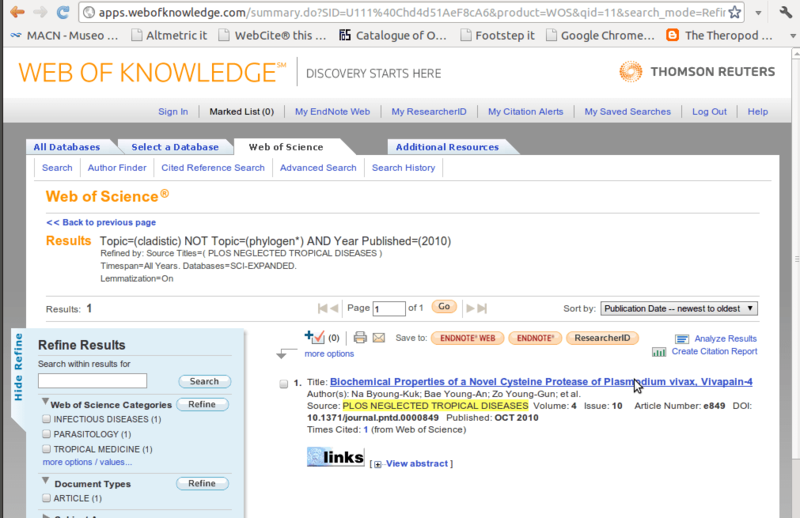 Furthermore, it’s Open Access and fully-digital – why aren’t they indexing figure caption text? It appears it’s not just figure caption text they don’t index. Do they index only titles and abstracts? many of the other 81 results (papers) of that search for ‘cladistic’ but NOT ‘phylogen*’ contain the word-stem ‘phylogen*’ in the full text of the paper! I guess I’m probably not the first to realise this but… wow. Is this not *really* poor service? I’m pretty sure my desktop software could do a better job of indexing than this. All it is, is simple string matching! …and of course I can do a better job of this myself with Open Access papers. All one need do is download the OA corpus from UKPMC and index the *FULL* text including figure caption text and reference lists yourself. I wonder how many more relevant papers I might ‘find’ with my searches if I did this rather than relying on Web of Science?